#Domain sightings : #Vietnomz .com is owned by #HugeDomains, so what to do? :DomainGang #Domain sightings : #Vietnomz .com is owned by #HugeDomains, so what to do? When the domain name matching your brand is taken, what can you do? In the case of VietNomz, a Florida based, modern street-fare concept on traditional Vietnamese cuisine, the matching .com is owned by HugeDomains. The company wants $2,295 dollars for the domain, and we’re not going to argue whether that’s fair or not. In a recent domain sighting, an encounter of domain names “in the wild,” we ran across the VietNomz van. The decal makes its social media handles visible, along with the phone number, and the domain name VietNomzFL.com. 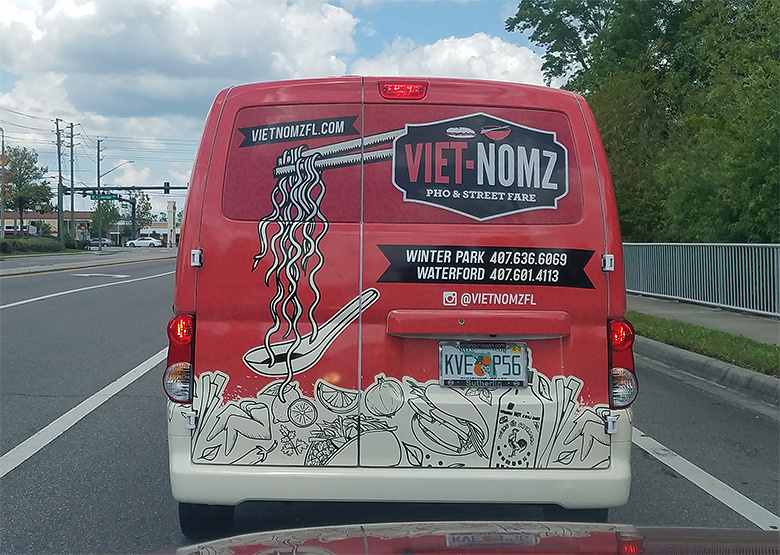 So if the brand is hyper-local, as in the case of VietNomz with a total of just two restaurants – both in Orlando, FL – the answer is obvious: tack the location onto the brand. I’d say they get better SERPS doing that too.